A Uyghur woman carries a toddler as children play near a cage protecting Chinese paramilitary policemen on duty in Urumqi, in a file photo. Dozens of Uyghur children from a mostly Uyghur-populated village in northwest China’s Xinjiang Uyghur Autonomous Region (XUAR) whose parents or guardians have been detained in “political re-education camps” have been sent to live in orphanages, according to sources. Beginning in April 2017, Uyghurs accused of harboring “strong religious views” and “politically incorrect” views have been jailed or detained in re-education camps throughout the XUAR, where members of the ethnic group have long complained of pervasive discrimination, religious repression, and cultural suppression under Chinese rule. An officer at the Chinibagh village police station, in the seat of Hotan (in Chinese, Hetian) prefecture’s Qaraqash (Moyu) county, recently told RFA’s Uyghur Service that local government officials were deciding the fates of children who had been left behind after their guardians had been sent for re-education. “Children left without parents have been sent to orphanages temporarily until their parents are released,” said the officer, who is a resident of nearby Yengisheher village, where sources recently told RFA that around 40 percent of the more than 1,700 residents had been detained in re-education camps. 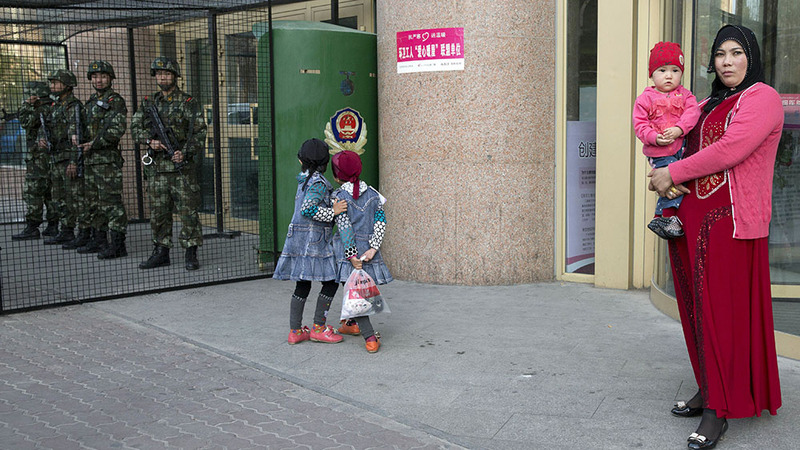 In October, a Uyghur officer at a police station in Kashgar (Kashi) prefecture’s Peyziwat (Jiashi) county told RFA that children whose guardians had been sent to camps there were also being sent to orphanages. With all of the overcrowding at orphanages around the region, authorities “are moving children to mainland China,” he said, though he was unsure of where they were being sent. He added that amid tightened restrictions in the XUAR, “it isn’t possible” for parents who have been released from re-education camps to look for their children in the orphanages. Reported by Shohret Hoshur for RFA's Uyghur Service. Translated by RFA's Uyghur Service. Written in English by Joshua Lipes.